Scientists have found some fossils from Burma in South East Asia that can provide some interesting news about the evolution of reptiles from the cretaceous Period. A series of CT scans has unveiled that the fossilized lizards belong to some 100 million years ago. During the cretaceous periods, animals that dominated the world were winged beasts, humongous slithering reptiles on land and insects. A very little information could be fetched about small tropical lizards until now. All it was found that the tender bones of tropical lizards disappeared very quickly when buried in the damp forest floors. The fossils which we are talking about were found in Burma about ten years ago. The samples were then kept in private collections until their recent donation to the American Museum of Natural History, which provided the scientists access for study. The lizards were trapped in the sticky resin from coniferous trees or amber. 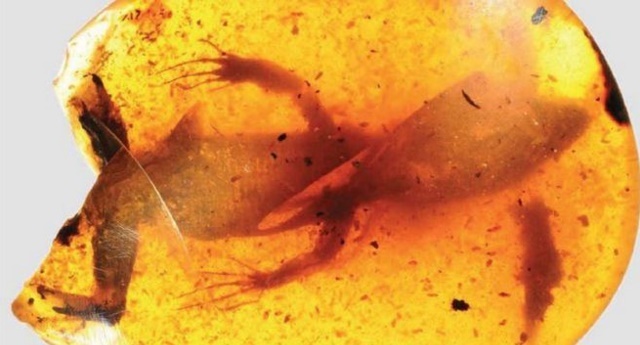 The lizards fossilized in amber were digitally dissected by researchers using CT scanners. It was found that condition with claws, bones, teeth, toe pads and even scales intact were quite good. “This diverse lizard assemblage shows that back in the day, the tropics were as lizard-friendly as they are today,” says Edward Stanley, who is a post doctoral student working in the same project. The variety of reptiles fossilized in amber were large. It included a variation of chameleon, species similar to modern-day geckos and chameleons, as well as a range of species that are a perfect blend of both ancient and modern reptile relatives.